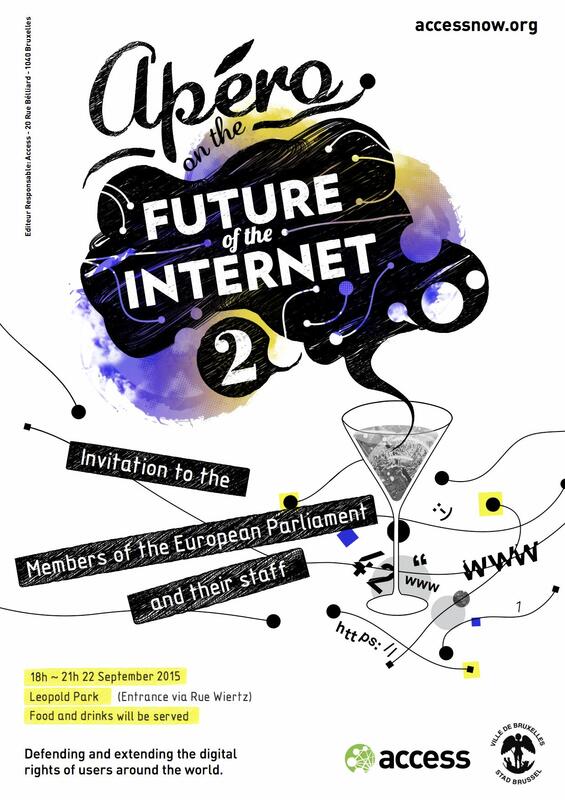 On Tuesday 22 September, Access Now will hold an apéro on the Future of the Internet at which our Brussels team and civil society representatives will meet with Members of the European Parliament (MEPs) and their staff. Held one year into the European Parliament’s mandate, this second iteration of our apéro is the perfect occasion for lawmakers and civil society representatives to reflect on the challenges and opportunities that lie ahead for tech policy. First on the agenda is the conclusion of the Telecoms Single Market proposal that has the potential to enshrine Net Neutrality across the EU, and completion of the long-awaited General Data Protection Reform that aims to update and strengthen data protection standards in the EU. The implementation of the Digital Single Market Strategy presented in the spring by Digital Commissioners Oettinger and Ansip will begin with a large number of consultations, starting with a major survey of the role of online platforms that will be launched this month. Negotiations for the Transatlantic Trade and Investment Partnership (TTIP) will continue as MEPs will be asked to produce an opinion on the Trade in Services Agreement (TiSA). Bringing transparency to the negotiations process for these massive trade deals remain key as talks could put internet users’ privacy and freedom of expression at risk. There are also the upcoming trialogue negotiations of the EU Passenger Name Record (EU-PNR) and review of the Smart Borders Package. Either one of these proposals could establish blanket surveillance of anyone entering or leaving the EU. We invite MEPs to join us for an informal discussion on these issues and more on September 22 from 18h to 21h in the Leopold Park, right behind the European Parliament in Brussels.